Burien is a growing city of 33,300 residents in King County, Washington. The city is situated 11 miles south of Seattle on the Puget Sound. It is only a few miles from the ferry lines to Vashon Island, Bainbridge Island, and the Kitsap Peninsula, and is just 5 miles from the Sea-Tac International Airport. Burien is also well known for its many recreational parks and a large number of health care facilities and services. 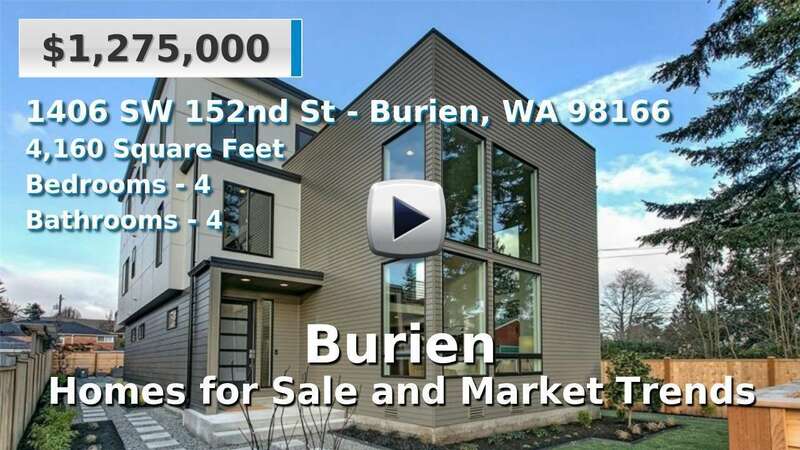 Though its total land area is just under 8 square miles, Burien’s urban center is growing rapidly and it is a beloved suburb of Seattle. Potential residents will mostly find single-family homes and condominiums for sale, many of which are waterfront properties. 4 Beds | 1 Baths | 1250 sq. Ft.
2 Beds | 2.5 Baths | 1430 sq. Ft.
1 Beds | 1 Baths | 652 sq. Ft.
4 Beds | 1.75 Baths | 1520 sq. Ft.
3 Beds | 1.5 Baths | 1320 sq. Ft.
3 Beds | 3.5 Baths | 3020 sq. Ft.
3 Beds | 3.25 Baths | 3690 sq. Ft.